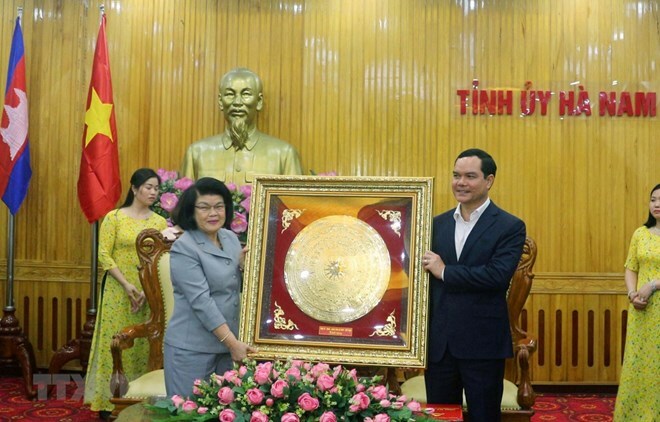 Ha Nam (VNA) – A delegation of the Cambodian National Assembly led by its Second Vice President Khuon Sudary visited the northern province of Ha Nam on March 23. The tour was made within the framework of their official visit to Vietnam. Member of the Party Central Committee and Secretary of the provincial Party Committee Nguyen Dinh Khang expressed his joy at the visit and briefed the guests of the local economic, cultural and social development. For her part, Khuon Sudary said the Cambodian lawmakers are happy at the province’s development. She also affirmed the long-lasting solidarity between the two countries and hope that the bilateral relations of cooperation and friendship will be further consolidated. The Cambodian official wished the province further development in every field.